With a staff that has over 125 combined years of experience in welding, Pendarvis Manufacturing is an expert in aluminum welding in the Southern California area inlcuding Anaheim and Los Angeles. Possessing extensive experience in the welding of many types of metals, including aluminum. Aluminum welding at Pendarvis Manufacturing is performed per AWS D1.2 specifications. Aluminum welding can be easily done using MIG or TIG welding processes depending on the project, aluminum series selected, and environment the component will be used in. An example of a component produced at the Pendarvis Manufacturing facility using aluminum welding is an aluminum shipping pallet for the aerospace industry. Other aluminum welding applications include aluminum irrigation pipes and aluminum engine components. 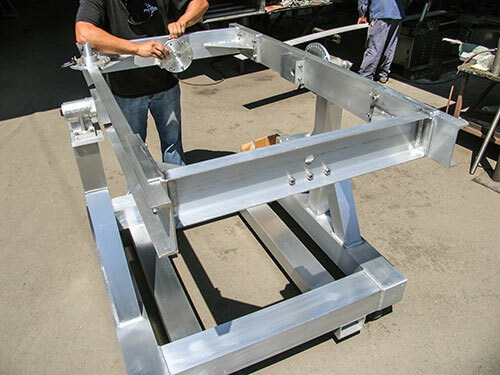 Pendarvis Manufacturing is one of the few welding machine shops in California that can weld virtually any aluminum shape, including sheet, tubing, channel, bar, plate and angle. Pendarvis Manufacturing recently completed an aluminum welding and fabrication project for California Institute of Technology that was an integral component used in testing a new state-of-the art land based radio-telescope. Not only do we have extensive experience in MIG and TIG welding, including aluminum welding, but Pendarvis Manufacturing can also provide precision welding services using stainless steel, bronze, and carbon steel, as well as many other metals. We invite you to call or email us with all your aluminum welding projects and other custom manufacturing requirements!